To accommodate those who would like to preview on the evening of Friday, Oct. 23, we will be extending our gallery hours until 8:00 PM. Light refreshments will be served. 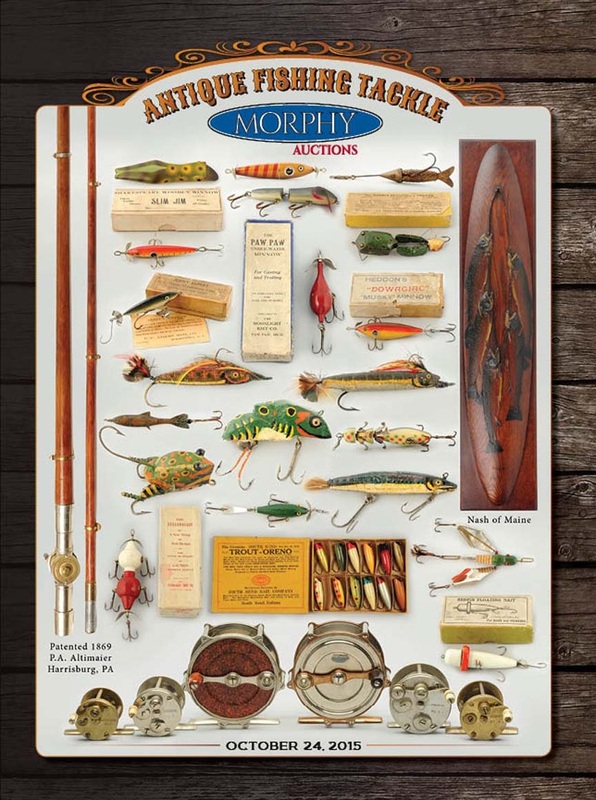 The fish will soon be biting at Morphy Auctions’ Pennsylvania gallery, with the announcement that the company has launched an Antique & Vintage Fishing Tackle, Baits & Ephemera department. Heading the newest of Morphy’s specialty divisions is Joe Stagnitti, a well-known dealer and collector who has had a committed involvement in the fishing collectibles hobby for more than 25 years. Stagnitti will be representing Morphy’s at collector and club events around the country. Additionally, he will manage Morphy’s twice-yearly fishing tackle sales, the first of which is set for October 24 of this year. Stagnitti recalls that his love of fishing was instilled at an early age. “My father, who died when I was age seven, taught me two very valuable things – to play baseball and fish. I’m past the age that I can play baseball, but I sure can fish,” he said. In 1989 Stagnitti started collecting old fishing lures and became a regular buyer at the barns, shops and showfields of Madison-Bouckville, a short distance from his home in Canastota, New York. “To the dealers who were set up there year round, I became known as the ‘kid’ who collected fishing lures. I would pass through there a couple of times a week. If they came across any lures, they would hold them for me,” Stagnitti said. During his first four years as a collector, Stagnitti said he thought he was the only person interested in old lures. Then he moved to the Dallas/Ft. Worth area for business, and that’s where he discovered and became a member of the NFLCC – the National Fishing Lure Collectors Club. In 1996, Stagnitti, who has degrees in landscape architecture and surveying and engineering, made the leap to dealing fulltime in antique and vintage fishing tackle and lures. “Soon I was setting up at 10 shows a year and also selling via the Internet. That’s how I developed a private clientele,” he said. Morphy’s is now accepting quality consignments of antique and vintage fishing tackle, baits and related advertising for their Oct. 24 auction. To discuss consigning, call Dan Morphy at 717-335-3435 or email info@morphyauctions.com.